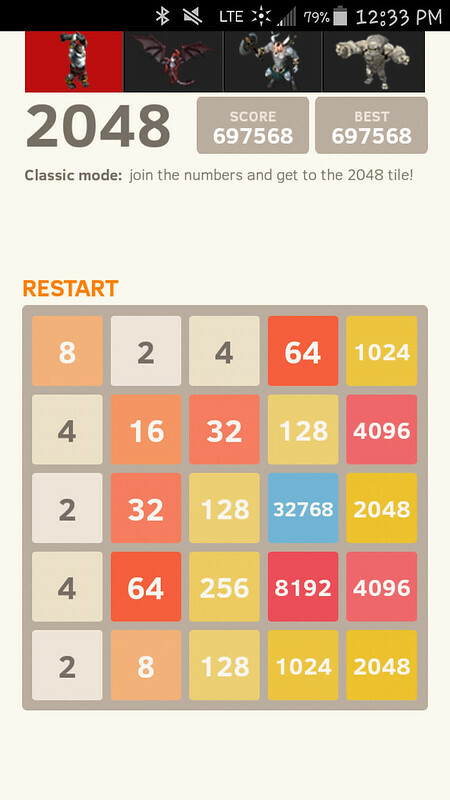 A screenshot of my final score on a recent marathon-length run on the game 2048. I get interested in different games. Earlier this year, I got into Tiny Towers. I have an on and off affair wtih 2048. The goal of the game is to keep doubling your score through combining 2's and 4's so that you keep adding up until you read 2048 (2, 4, 8, 16, 32, 64, 128, 256, 512, 1024, 2048). It's a fun but idle game you can play. For all of last year, I could get up to about 4096 but usually not much farther--I think once I got up to 8192. However, recently a former student and friend of mine shared his latest high score on Facebook and it was higher than I thought possible. So I returned to the game after a long break from it and started playing again. I soon found that I made it to his score and with this game surpassed it. I was amazed by it--not that I beat it but that by the fact that I knew it was possible motivated me to go back and attempt it again. I think that's one of the most fascinating things about our lives--sometimes, when we realize others can do it, it gives us some sense that it might be possible for ourselves. I know that's why I talk so much about running and other ventures--I regularly hear from people who say that my talking about it, made them consider trying it out. I love that contagious experience. Well, I should probably get back to the game; I've got a new score to break!